Ways to use Flip Catalogue Software to cut landscape pages when importing PDF. When use Flip PDF software to create flipbook from PDF file, I found some imported PDF pages was irregular arrangement, some pages too small and some pages too larger. So, can I cut the landscape page when import PDF to make the flipbook looks clean and tidy? 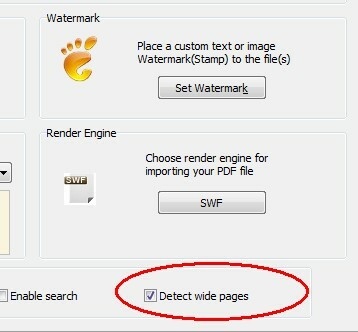 Yes, you can use “detect wide page” feature of A-PDF to Flipbook to intelligent arrange the flip pages. Step1: Step1: Launch your A-PDF to Flipbook, and then build a new Flipbook Project. Step 4: Click the button “import Now”, import your PDF. Done!